Flexibility is key when dealing with volatile commodities like oil and natural gas. These two oil majors have the most room to move. The steep decline in oil prices that started in mid-2014 was shocking, with the swift drop from $100 a barrel to less then $30 showing just how volatile the vital fuel can be. Many oil drillers were bleeding red ink during the worst of it. Now that oil is back into a range where oil majors are profitable, investors shouldn't forget a key lesson of the downturn -- flexibility is important. And on that point, ExxonMobil Corporation (NYSE:XOM) and Chevron Corporation (NYSE:CVX) are two of the best positioned oil majors. Here's why these two energy giants outshine their peers. Exxon distinguished itself during the oil downturn by continuing to increase its dividend every year, extending it streak of annual increases to 36 years. Most of the other oil majors paused their hikes or cut their dividends. One of the key factors that allowed Exxon to continue to invest in its capital program and raise the dividend was that it made judicious use of its balance sheet. At the start of 2014, before the oil sell-off, Exxon's long-term debt stood at around $6.5 billion. It peaked at nearly $28 billion at the end of 2016. That's a huge increase in leverage in just two years. However, the absolute numbers don't tell the whole story. Long-term debt as a percentage of the capital structure went from a minuscule 4% to a still low 15%, over the span. Exxon's rock solid balance sheet gave it the financial flexibility to continue to support its business and reward investors with dividend hikes despite the oil price headwind. Exxon has started to pay down its long-term debt now that oil prices have recovered, bringing it down to around 11% of the capital structure, and it remains one of the least leveraged oil drillers. 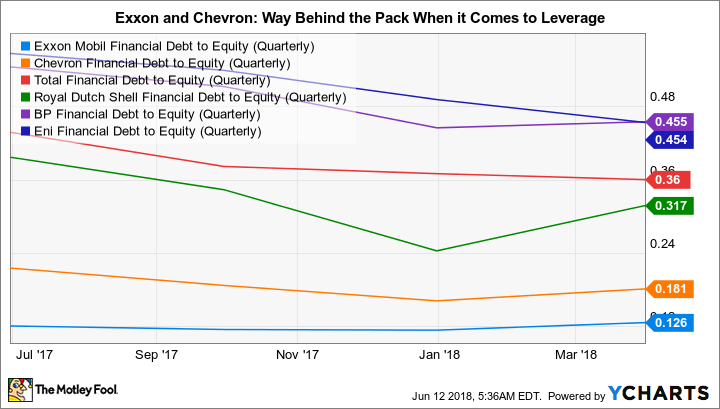 Chevron is nearly as conservative with its balance sheet as Exxon, with long-term debt making up roughly 18% of its capital structure, providing it with ample flexibility, as well. Royal Dutch Shell is the closest major peer, with long-term debt making up a little over 30% of the company's capital structure. To be fair, Shell and its European peers tend to keep more cash on hand than Exxon or Chevron, which levels out the leverage issue on a net basis. However, during downturns the higher debt levels leave these companies with less wiggle room on the liability side of their balance sheets. Conservative investors should favor the low-debt approach taken by Exxon and Chevron in what is a highly cyclical industry. The oil downturn, however, is in the past. Investors tend to focus more on the here and now. On that score Exxon is an underperformer today. Its production fell in each of the last two calendar years, dipping nearly 3% between 2015 and 2017. That's not the right direction to keep investors happy. The company's return on capital employed, meanwhile, fell through the downturn along with peers and now sits in the middle of the pack after years of being ahead of the pack. 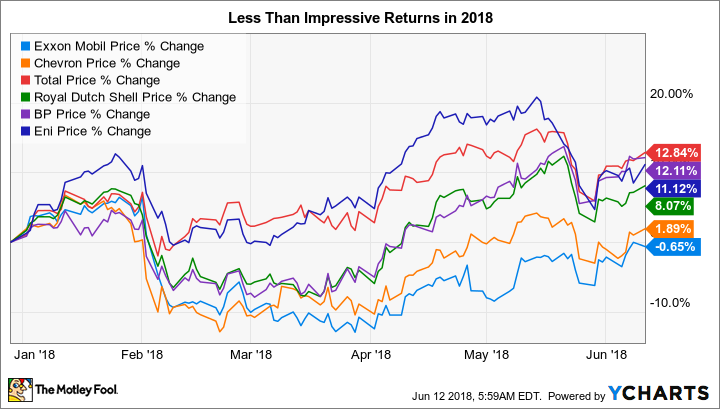 It's not surprising that Exxon's stock is roughly break even so far this year while many peers are seeing gains in the high single digits and low double digits. However, Exxon is aware of the issues and is doing something about them. For example, it has been working on a number of large projects (including in the onshore U.S. market, Guyana, and Mozambique, among others) to improve its production profile. The results are starting to show up in Exxon's reserve figures, which increased a touch over 6% in 2017. And in an effort to improve returns, the oil giant plans to take a leading role in more of its projects. It believes this will allow it to push return on capital employed from the mid-single digits into the mid-teens as it puts its large project expertise to better use. That said, it's a large and conservative company, and it will take time to turn the ship. If you are willing to think long term, the stock's price to tangible book value hasn't been this low since the 1980s and the yield hasn't been in the 4% range since the mid-1990s. Add in a rock solid balance sheet, and there's a lot to like here. Chevron's stock hasn't been faring quite as badly as Exxon's, but it's only up a little more than 1%, so it still hasn't been a good year for investors. That, however, seems at odds with recent quarterly results, which have been pretty solid, including a 6% increase in production year over year. There are two important things to note about Chevron from here, however, that could be important to long-term investors. First, Chevron has been reducing its exposure to downstream operations by selling refining assets. That increases its exposure to the upstream (oil and natural gas drilling) piece of the business. That isn't a bad thing, but it means commodity prices will have a larger impact on the company's results than at more diversified peers like Exxon, which has long focused on balancing its upstream business with downstream operations. Increased commodity exposure, however, has been a net positive this year. Second, and more notable for the stock price, is that Chevron's capital plans aren't nearly as aggressive as many of its peers.The oil giant's capital spending was roughly cut in half between 2014 and 2017 and it looks like it will be stuck in the current $18 billion to $20 billion range for the next few years. Peers, including Exxon, have far more aggressive plans. Investors, perhaps rightly, would seem to prefer to see Chevron take a more aggressive approach. That said, Chevron's efforts in shale oil space have been producing very strong results and exceeding expectations. The Motley Fool's Tyler Crowe believes this will turn out to be the company's "ace in the hole" and a good reason for investors to like this conservatively financed oil major. Especially when you combine it with the company's conservative balance sheet and 3.5% yield. Oil and natural gas are commodities that, at times, experience swift and extreme price swings. Although Exxon and Chevron are taking different approaches to growing their businesses today and are facing some headwinds, they both have very low levels of long-term debt. That gives them the financial strength to execute their growth plans and deal with any commodity price adversity that comes their way. If you are a conservative investor looking for a long-term energy holding, both Exxon and Chevron are worth a closer look.